More of my reviews at Secrets of Lost Words.Rating: A-In Scarlet, we get introduced to.. well, Scarlet. She's Little Red Riding Hood and her grandma got kidnapped so she has to go save her. 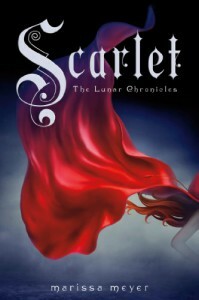 Scarlet is just as interesting and badass as Cinder and I really enjoyed reading about what she was doing. From the beginning, you can see that Scarlet had one clear goal: To rescue her grandma. I felt like that's really good because with a lot of books, the protagonist didn't even know where she was going half the time. I felt like this was straight to the point and the readers could start getting excited.One of my weirdest trait is that I get really annoyed by changing point of views. This was not the case with Scarlet! I think the changing perspectives between Scarlet, Cinder, and Kai was very well done. They had different voices and they had different stories going on that I was never confused thinking, "Wait a minute, who is this again?" I also really enjoyed Scarlet and Wolf's romance :) Wolf is such a badass toughie on the outside but on the inside.. *sigh* it's all mushiness for Scarlet. I can tell he really loves her and that he doesn't really know what to do with the feeling since he never liked anyone before.We also got to be in Queen Levana's head for a bit! That's was really interesting and I can't tell you how many times I wish what she was thinking in that head of hers ;)One thing I gotta complain about, girlfriend, is the lack of our beloved Prince Kai. WHY IS THERE NO KAI IN HERE??? Well, we did get to read about him but he never interacted with any other characters. We only saw him handling the kingdom. That wasn't fun at all. I thought Cinder and Kai were going to have a romantic reunion or something *sigh*The other thing was that Cinder and Scarlet's plot merged near the end. I wish they met each other sooner because I quite enjoyed reading about the two together.Scarlet was a really suspenseful book with everything going on. I just couldn't put this down. When one thing with Scarlet was finished, I wanted to keep reading so I can see what's going to happen with Scarlet. That's very bad for my grades lol (not getting hmrk done). Romance and adventure with Scarlet + Wolf is very interesting and my favorite part of the entire book :D I enjoyed this book a lot and can't wait for Cress!P. S. But seriously, we need more Kai, okay?